During the night, Emerald Star had passed Frankfurt. 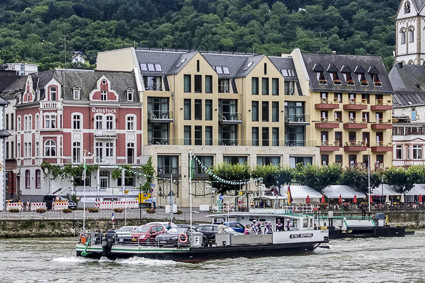 When we opened our curtains on Saturday morning, we were cruising past Eltville at Rhine Km 511, which was just north of Mainz and Wiesbaden. 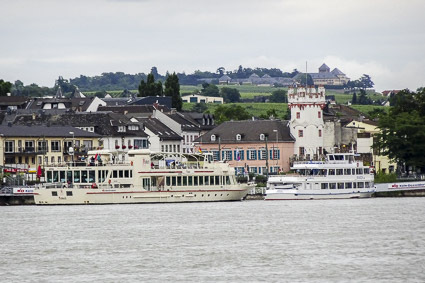 On the Rhine, kilometers are measured from the city of Konstanz, Germany, on the Bodensee (a.k.a. Lake Constance). The Rhine joins the North Sea at the Hoek van Holland, Km 1036.2 Km. 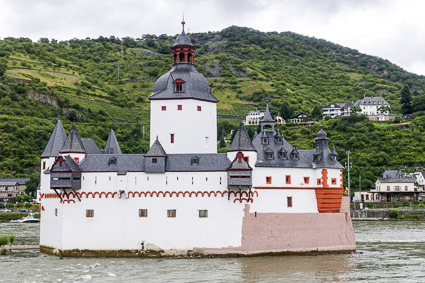 The Middle Rhine, where most of the river's famous castles are located, is roughly between Bingen (Km 526) and Koblenz (Km 593). 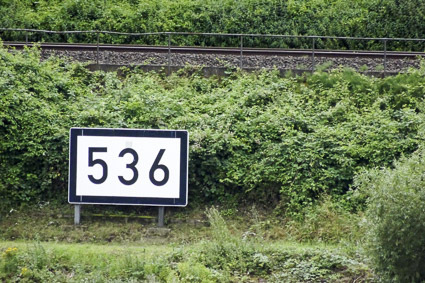 In addition to "Rhine Kilometer" markers at 1-Km intervals, the river has tenth-Km markers and "plus" markers that represent half-Km. 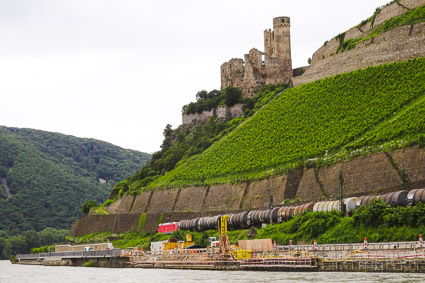 As Emerald Star cruised north, we approached Burg Ehrenfels, or Ehrenfels Castle, near Rüdesheim on the river's right bank. 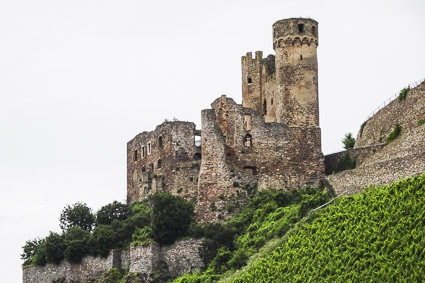 The fortress (now a ruin) was built in 1212, later served as a Rhine toll station, and was damaged in the Thirty Years War and again in 1689 during the Siege of Mainz. 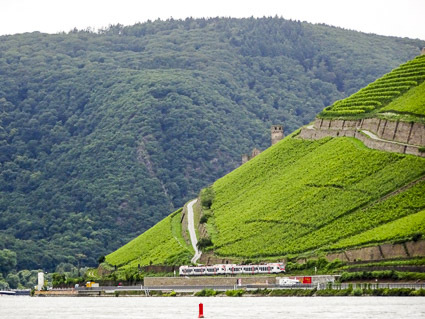 Nearby, the pretty wine village of Rüdesheim had two sightseeing boats moored along the waterfront. 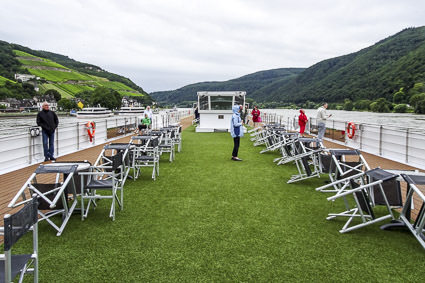 As Emerald Star cruised north, we spent most of our time on the Sun Deck, where the weather was cool and drizzly but the scenery was spectacular. 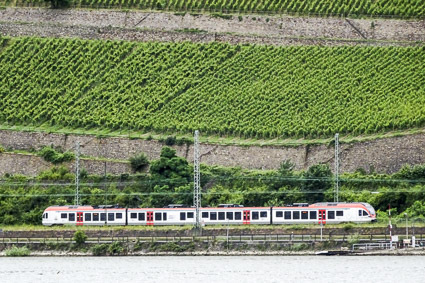 Vineyards and Deutsche Bahn railroad tracks lined both banks of the Rhine. 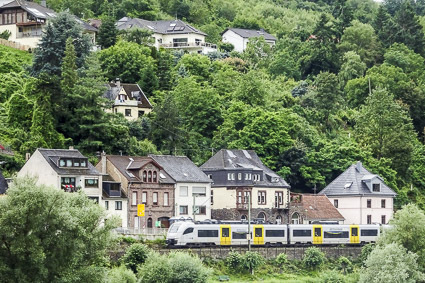 We enjoyed views of towns and villages, and the residents enjoyed even better views of the Mittelrhein. Another minute, another medieval castle: In this case, Burg Reichenstein (now a museum and boutique hotel) and St. Clement's Chapel. 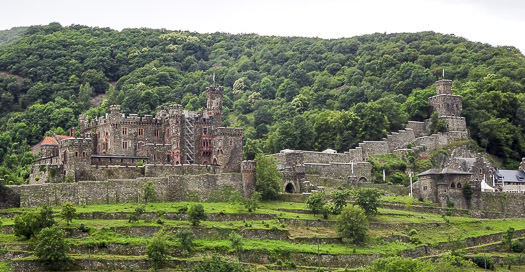 The castle, also known as the Falkenburg, is a popular venue for weddings and honeymoons. 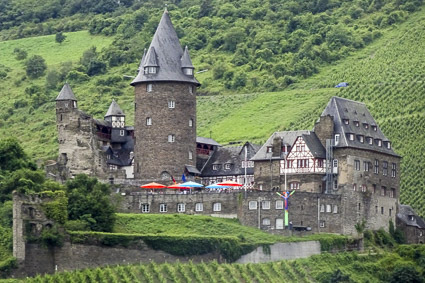 Stahleck Castle, at Bacharach (Rhine Km 543), displayed the colorful umbrellas of its DJH Youth Hostel. 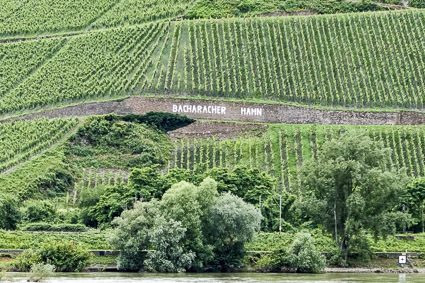 A vineyard near Bacharach had a billboard built into the hillside. 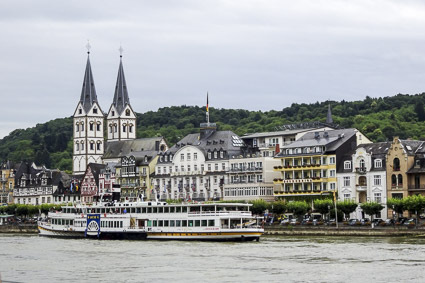 From roughly 800 to 1800 AD, there were 79 toll booths along the Rhine, collecting tolls for a long line of emperors and "robber barons." You can read more about them here (PDF document). 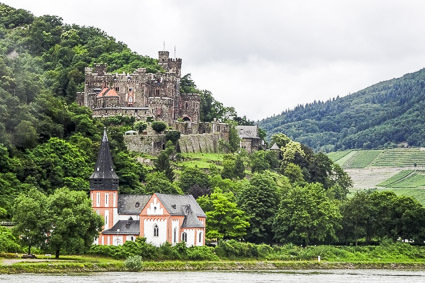 This small castle, Pfalzgratenstein,, is a former toll station at Kaub, on the west bank of the Rhine between Stahleck Castle and Burg Schönburg. 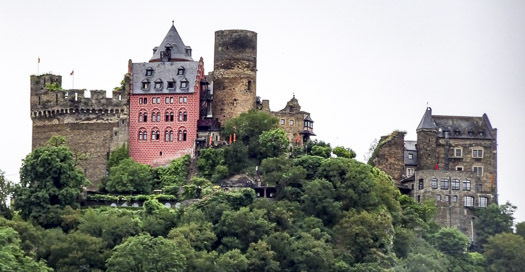 The Burg Schönberg, now a four-star castle hotel, was a few miles north at Oberwesel, near the entrance to the Rhine Gorge (possibly the most scenic stretch of the Rhine). 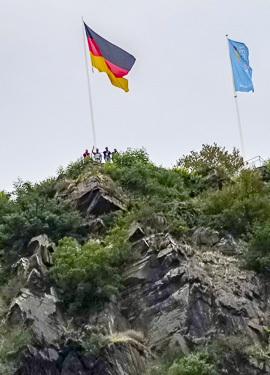 The Lorelei Rock, named after the siren of the German folktale and Henrich Heine poem, loomed over the Rhine just before St. Goar and St. Goarshausen. 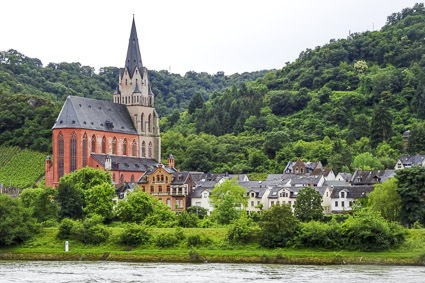 We passed more castles and the occasional church, then encountered a car ferry near Boppard.